Areas that are "targeted" by the Federal Government were identified in the 2010 Census as areas in California where 70 percent of the families who live there earn an income that is 80 percent or less than the statewide median income. Forty-five (45) of California's 58 counties have targeted areas - with 37 percent of the areas located in Los Angeles County. How do I locate Targeted Areas in California? If you know the census tract number: Use the IRS list of 2014 Qualified Census Tracts by county. 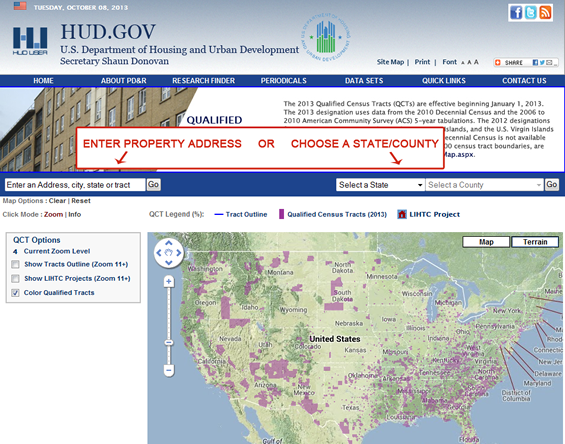 If you have a street address: Visit HUD's interactive QCT Map and enter the property address to view what Census Tract the property is located. Once you have the census tract number then compare it with the IRS list of 2014 Qualified Census Tracts to see if you have a match.